On August 6, 2012, at 05:17 UTC, NASA has successfully landed a Mini-Cooper-sized rover, Curiosity, on Aeolis Palus in Gale Crater on Mars. The 900-kg rover (899 kg, to be exact, which is 1,982 lbs) is equipped with six 50 cm (20 in) diameter wheels in a rocker-bogie suspension. Notes 1 For the first time in the history of the space exploration, the suspension system also served as landing gear for the vehicle, unlike its smaller predecessors. Tire and wheel development for space exploration has been a focus of research at NASA Glenn Notes 2 for decades. Evolving since the days of Apollo, NASA engineers started examining tire designs back in the 1960’s for use on the surface of the Moon. 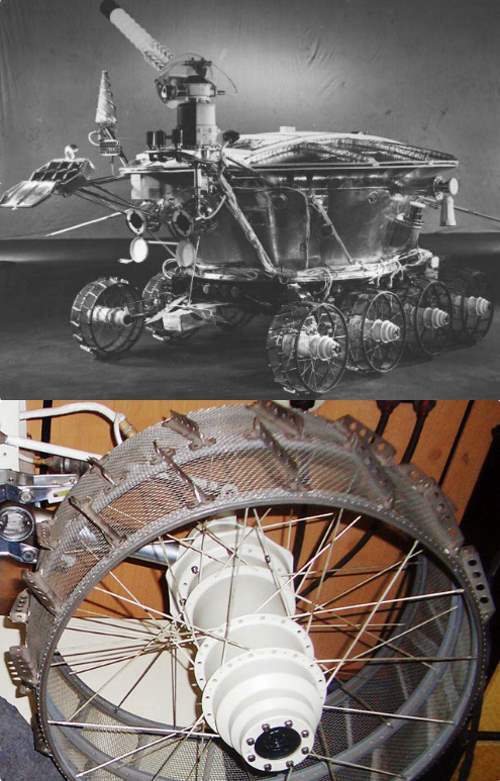 The Russian vehicle Lunokhod (Moonwalker in English), which was a series of Soviet robotic lunar rovers designed to land on the Moon between 1969 and 1977 used eight rigid rim wire mesh wheels with bicycle-type spokes and metal cleats for traction. The Modularized Equipment Transporter (MET) Rover was a two-wheeled cart featuring rubber tires that were inflated with nitrogen. They were designed to make it easier to pull the cart through the soft and forgiving lunar soil. The tires were manufactured by the American multinational tire manufacturing company Goodyear. The last NASA vehicle to visit the Moon was the Lunar Roving Vehicle (popularly known as “Moon buggy”). It was used on the Moon in the last three missions of the American Apollo program (15, 16, and 17) during 1971 and 1972. This manned vehicle used four large flexible wire mesh wheels with stiff inner frames to prevent over-deflection. Thin tread strips were attached to the carcass to enhance flotation in the soft lunar soil. The wheels were designed and manufactured by General Motors Defense Research Laboratories in Santa Barbara, California. Before Curiosity, all Mars rovers (Sojourner, landed in 1997; Spirit, landed in 2004 and Opportunity, also landed in 2004) have used solid aluminum wheels. But the Curiosity rover is much heavier. Even it has a top speed of just 0.15 km/h (0.093 mph), this snail’s pace still had enough force to tear holes into its aluminum wheels. The wheels had to be stiff enough the weight of the rover (899 kg/1,982 lbs), need to be as light as possible to reduce launch cost, and must be able to maintain traction and navigate the unpredictable and rough Martian terrain. This wasn’t an easy task. Unfortunately, NASA underestimated the roughness of the Mars terrain. 0.75 millimeter-thick wheels of Curiosity (around the same thickness as a credit card) began getting damaged pretty quickly. 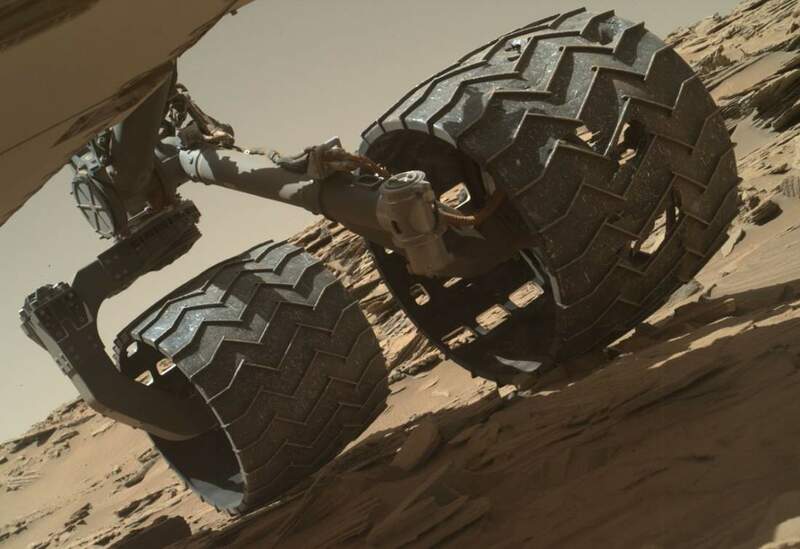 In 2013, a little over a year after the Mars Curiosity Rover landed on Mars, engineers began to notice significant wheel damage due to the unexpectedly harsh terrain, causing concern about the ability of the rover to drive far enough to complete its intended mission. The Curiosity rover cost 2.5 billion dollars to develop. Extending the life of the mission was very important for NASA. Since there are There are no mechanics on Mars, the next best thing for the rover was careful driving. To able to do this, a new algorithm was developed at JPL (Jet Propulsion Laboratory) by Jeff Biesiadecki and Olivier Toupet. The software, referred to as traction control, was adjusting the speed of Curiosity’s wheels depending on the rocks it’s climbing. After 18 months of testing at NASA’s Jet Propulsion Laboratory in Pasadena, California, the software was uploaded to the rover on Mars in March. Here on Earth, the air-filled rubber tires can withstand similarly rough terrains. So, why not using them on them on Mars? This is impossible because of the climate of Mars. The red planet is a harsh place, even Antarctica, which is an incredibly difficult place to work and live, is like a heaven compared to Mars. Temperatures on Mars can dip as low as -130 °C (-202 °F). Temperatures this low transform rubber from an elastic material capable of absorbing stress to a glass-like material, making it useless for that kind of missions. Another problem is radiation. Mars has no magnetosphere (it has collapsed around 3.7 billion years ago) and its atmosphere is very thin, equivalent to about 1% of Earth’s at sea level. So, there’s no protection from solar winds on the surface of Mars. Rubber would also degrade from the UV radiation it would be exposed to. Last but not least, rubber wheels are heavy. This would dramatically increase the launch cost. Another option could be flexible wire mesh wheels with stiff inner frames, like those used on the Lunar Rover. This option was studied for applications on Mars, but the Lunar Rover had a mass of just 450 kg (992 lbs) compared to the 900 kilograms (1,884 lbs) of the Curiosity rover. Combine this with higher gravity on Mars Notes 2, and it made these wheels unsuitable for the Martian terrain. The wheels simply not be able to hold the weight of the vehicle without deforming permanently. During the mid-2000s, NASA Glenn engineer Vivake Asnani worked with industry partner Goodyear to develop the Spring Tire, an airless compliant tire that consists of several hundred coiled steel wires woven into a flexible mesh, giving the tires the ability to support high loads while also conforming to the terrain. The Spring Tire has been proven to generate very good traction and durability in soft sand and on rocks. This innovation led to an R&D 100 Award for Top Inventions of the Year. Spring tires are light, they are capable of bending, and conform to the terrain without permanently deforming. They are also capable of holding a heavy vehicle. Engineers use a new material called Nickel titanium, also known as Nitinol (part of shape memory alloy). Nitinol alloys exhibit two closely related and unique properties: shape memory effect (SME) and superelasticity (SE; also called pseudoelasticity, PE). Shape memory is the ability of nitinol to undergo deformation at one temperature, then recover its original, undeformed shape upon heating above its “transformation temperature”. Superelasticity occurs at a narrow temperature range just above its transformation temperature; in this case, no heating is necessary to cause the undeformed shape to recover, and the material exhibits enormous elasticity, some 10-30 times that of ordinary metal. These incredible properties of Nitinol are not just good for applications in space, but right here on Earth. After building the shape memory alloy tire, Glenn engineers sent it to JPL’s Mars Life Test Facility. It performed impressively on the punishing track (see the video below). They would allow rovers to explore greater regions of the surface than currently possible. Because they conform to the terrain and do not sink as much as rigid wheels, they can carry heavier payloads for the same given mass and volume. Because the compliant tires can absorb energy from impacts at moderate to high speeds, they can be used on crewed exploration vehicles which are expected to move at speeds significantly higher than the current Mars rovers. “How NASA reinvented the wheel” by Real Engineering channel. A correction: Curiosity It does not use a nuclear reactor to power itself. It uses an RTG – a Radioisotope Thermal Generator, which converts the heat from a decaying 5-kg slug of plutonium into electricity using Peltier devices. It is not very fancy, has no moving parts, and is very reliable, but it produces low power, at less than 110 watts total output. Curiosity’s RTG is the Multi-Mission Radioisotope Thermoelectric Generator (MMRTG), a type of radioisotope thermoelectric generator developed for NASA space missions, designed and built by Rocketdyne and Teledyne Energy Systems under contract to the U.S. Department of Energy. The term “bogie” comes from old railroad systems. A bogie is a train undercarriage with wheels that can swivel to curve along a track. The term “rocker” comes from the design of the differential, which keeps the rover body balanced, enabling it to “rock” up or down depending on the various positions of the multiple wheels. U.S. bicycle manufacturer Litespeed has been a contractor and consultant to NASA for projects that require titanium-intensive sub-assemblies including the landing gear on the Curiosity. NASA Glenn Research Center is named after Colonel John Herschel Glenn Jr. (July 18, 1921 – December 8, 2016), a United States Marine Corps aviator, engineer, astronaut, businessman, and politician. He was the first American to orbit the Earth, circling it three times in 1962.